You may also want to add. This kit is about as close to a master kit as you will find. Lots of parts not usually found in today's kits. Mercarb marine carburetor rebuild kit. We offer 2 floats for this carburetor. The Nitrophyl float is like the original. Many prefer the brass which is also available. UPDATE - We discontinued the Nitrophyl float. We have found the current made Nitrophyl float does hold up with today's fuel. We recommend using the brass float. When setting the float level, set it level. w/229 3.7L, 185 w/262 4.3L, 200, 470 w/224 3.7L, 898 w/305 5.0L. Don't forget to change the float at rebuild time. These carburetors have nitrophyl floats and they absorb fuel over time. 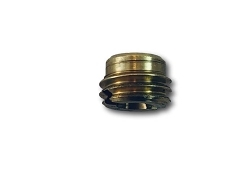 We now have brass floats available for these carburetors. Mercarb has 1 idle mixture screw. 2 Jets have 2 idle mixture screws. I received this carb kit as promised. It is a complete kit for this carb. It was great that both accelerator pumps were in the kit because ther is no way to tell which one was needed till the carb was disassembled. Great price and no hassles. Thank you!!! I wish i would have found mikescarb earlier. it would have saved ALOT of problems and $$$. i wound up buying seperate parts because the supplier said no master kit was available and i wound up buying individual parts at a huge cost. lesson learned? 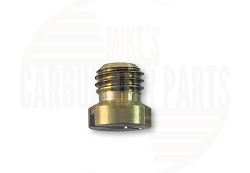 Get parts from Mike !!! I really like this carburator kit, it came with everything that I needed to rebuild the carburetor. One other thing that I liked about it was that it came with both accelerator pumps. I would highly recommend if you're going to build this carburator to get this kit. It's a lot cheaper than I've seen on other sites and still comes with everything that you need. This kit had everything I needed to get the job done. The online videos helped me completely re-build the carburetor on my 1992 Sea Ray. This is worth noting because I had never done this before. Great customer service when I called in looking for the correct parts etc. Glad I chose to order this rather than search at local boat stores. Top quality kit with everything you need for a comprehensive rebuild. Instructions video was great also! I highly recommend this kit if you want to resurrect your carb's performance. Would only suggest one additional thing. Instructions on how to adjust the idle mixture for peak performance would be great. Arrived on time! The packets look good. I Have not attempted rebuild as yet. This is not the first item I have ordered from Mikes. This particular kit is a great value and has extra parts for the optional configurations.Truly is a master kit at a great price! The service is excellent, the standard shipping time from Washington state into the upper Midwest was quicker than expected and best of all, their online resources for the specific carb (2-bbl Marine Rochester) I have is exceptional! I'm a customer for life! My only suggestion is to put a note on the exceptionally detailed instruction sheet regarding the check ball for the accelerator pump.. My carb is one that does not take it and I did go to the auxiliary video to confirm that it was correct. You actually illustrate the two variations on the Accelerator Pump rod-both included in the kit. Q: Have a mercurial 3.7 470 with an Sierra 2 barrel aftermarket carb with no numbers will this kit work on this carb? Q: Will this work on 4.3 with tks? Is float the same? Q: will this kit work for carb with tks? Q: This looks like the kit that I need for my 2 barrel mercruiser carb.. unfortunately, the serial number that is clearly marked on my carb (06082A-1) doesn't seem to be a goo Mercarb number.. thoughts/suggestions? Q: I am rebuilding a 807312 Mercarb 2bbl I assume this is the proper kit . I have heard some squawk about making sure this has the fat base gasket to insure proper mixture adjustments. Does this kit have the thick base gasket ? Q: I have a Mercruiser MCM 3.0L, 181 CID, 130hp, S#B462188. The MerCarb Number is 1389-9350. The nearest I have found includes an "A2" on the end? Does that signify anything or is this the right rebuild kit for me? Q: I have a Merc 5.0 305 cid and the only numbers on the carb is on a sticker that says SAE J1223 MARINE. Will this kit fit it? Q: Does the float needle connect to the float via clip? If so, how does the clip connect to the needle, since the needle is 2 or 3 parts?